It is good that TNB is taking proactive measures to mitigate the risk of inability to supply sufficient power to Peninsula Malaysia. The catchy keyword is coal, and because it is coal, it is sensitive. Setting up of coal-fired power plant is controversial (we have such experience in Sabah) because the potential for environmental pollution is very high. The proposed 300 MW coal-fired power plant in Lahad Datu was scrapped due to the people's objection. Contrary to this, n West Malaysia, though, coal-fired power plant is one of the bigger contributors to the energy generation mix. There are also coal-fired power plants in Sarawak. So, the real question here in Sabah is, are we looking more towards solution of the perennial issue of blackout/power failure or are we more looking at the environment alone? Of course there is a balance to be struck, but you cannot have the best of both. 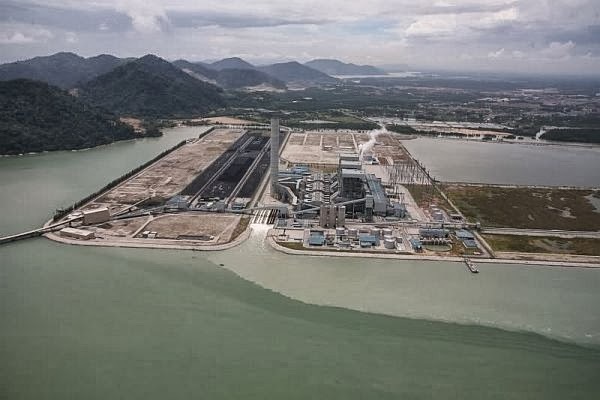 Tenaga Nasional Bhd (TNB) will build two high-technology 1,000 MW coal-fired power plants in Manjung, Perak to meet the increasing demand for electricity. Its vice president of generation Zainuddin Ibrahim said the two projects will start soon and will be completed within the next four years. The power consumption is expected to increase by 5% annually and the two projects are in the company's pipeline. "The two projects in Manjung are mainly for domestic usage and are expected to be completed in 2017," he told reporters after launching the 3rd Annual Asian Sub-Bituminous Coal User Group Conference which was attended by over 140 industry professionals from 15 countries including Malaysia, the United States, United Kingdom, South Korea, Thailand, Indonesia and Russia on October 1, 2013. TNB believes that coal is one of Malaysia's most important sources of energy, and over 80% of coal in Malaysia is imported from Indonesia, South Africa and Australia. The utility's annual consumption of coal is about 42 million tonnes and the trend continues to increase, with Asia being the biggest market for coal for power plants, accounting for 67% of worldwide demand.